This lovely country style B&B is set on 20 acres of spacious lawns and beautiful cottage gardens, all surrounded by tall Blackwood Trees and rainforest. 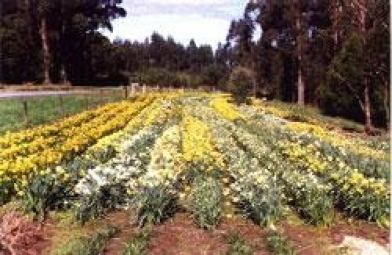 Cottage Flower Farm Bed & Breakfast is rated 4 stars and is located 2km west of Lavers Hill at Melba Gully. The property features 2 Queen Suites and 1 Twin Share Suite all with private Ensuites. A central guest lounge/dining area features a cosy wood fire, couches and separate dining tables. All linen, towels and homemade aromatherapy soaps and a fully cooked country style breakfast with homemade jams and freshly laid eggs are included. Cottage Flower Farm Bed & Breakfast is centrally located to the many amazing features of the Great Ocean Road. Melba Gully Rainforest Walk and Glow Worms - 5 mins. 12 Apostles - 40 mins. Otway Fly Treetop Walk - 15 mins. Cape Otway Lightstation - 35 mins. Johanna Beach - 15 mins. Apollo Bay - 45 mins. Port Campbell - 45 mins. From Geelong,Come through Geelong on the M1 and look for signs to the Great Ocean Road. Continue on the Great Ocean Road till you are past Apollo Bay. Look for the brown signs to Melba Gully on your left and turn left down Melba Gully Road. From Warrnambool on the Great Ocean Road heading North towards Melbourne on the Great Ocean Road, look for signs to Melba Gully and Lavers Hill. Turn right into Melba Gully Road after the township of Lavers Hill.